Editor’s Note: Click here to download the PDF and/or view in a slideshow the 1968 profile in its entirety. 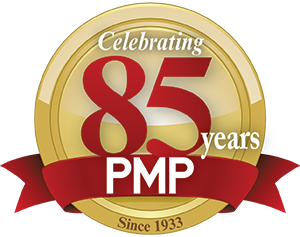 For the past two December issues of Pest Management Professional (PMP), we have focused on profiling women in pest management. We have interviewed business owners, association leaders, heads of manufacturing companies and industry researchers. There’s a long list of women we have yet to profile; our December 2018 coverage will whittle the list somewhat. In 1968, the December issue also featured a woman on the cover. But it was probably much more of a surprise to readers back then than it would be today. 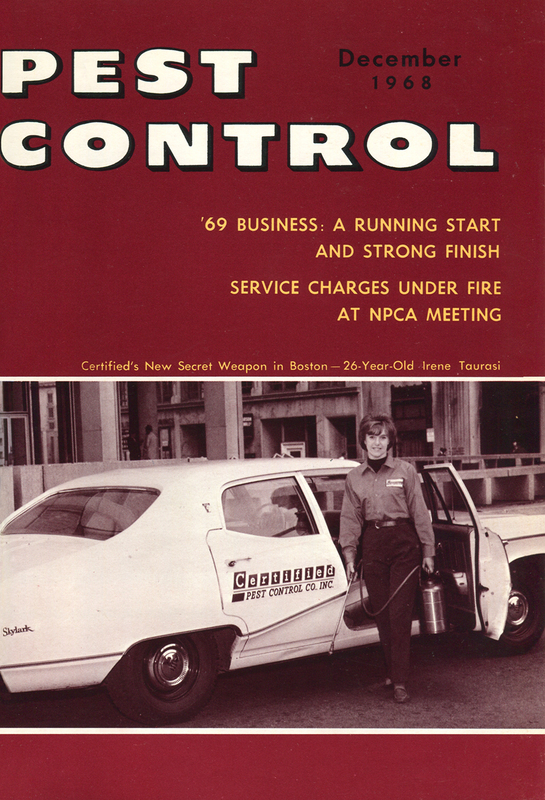 With a cover line of “Certified’s New Secret Weapon in Boston — 26-Year-Old Irene Taurasi,” the cover features a woman standing by her work vehicle with a compressed-air sprayer, ready for her next account. 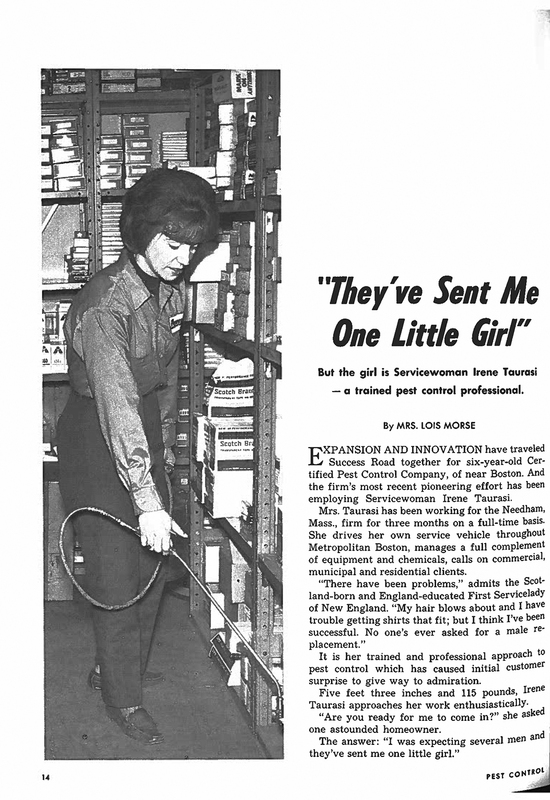 Inside the issue, the headline and deck are “‘They’ve sent me one little girl…’ But the girl is Servicewoman Irene Taurasi — a trained pest control professional.” The article chronicles how Certified Pest Control Co. (CEPCO), founded in Needham, Mass., in 1962 by Joseph Fleischer and his sons Aaron and David, took a chance on Taurasi and were pleased with the results of its so-called “experiment.” The Fleischer family has been in pest management since the 1930s, a tradition that continues today. CEPCO was ahead of its time not only in hiring Taurasi, but giving every employee a financial stake in the company. What the article, written by Fleischer family friend Lois Morse, did not include was that Taurasi was married to CEPCO technician Mike Taurasi. That tidbit comes from a March 2018 interview with Aaron Fleischer’s son, Dan — who with his son, Doug, runs Pestex in Framingham, Mass. “Could she handle the work? How would she respond to rats in a crawlspace or cockroaches falling into her hair? How would male customers respond to her in challenging commercial accounts? It turns out, Dan reports, that they had nothing to worry about. She also influenced Dan himself when he struck out on his own, founding Pestex in 1991 after CECPO sold its business in 1988: “I never had any second thoughts about hiring female technicians.” He’s had two over the years, and although there haven’t been female applicants lately, he notes that his younger daughter, Allison — a product manager in the footwear industry — “casually” mentioned in recent weeks how she could really bring value to Pestex. Son Doug returned to the fold five years ago after working in the solar industry. Oldest daughter Jill, a neuropsychologist, is expecting the first grandchild of Dan and his wife, Valerie, this month. Unfortunately, Taurasi has left no digital trail for us to follow. Dan estimates she retired in the mid- to late 1970s. But we are left impressed by the progressive thinking of the Fleischers in welcoming her as a technician, and by Taurasi herself, who proved to be a worthy member of the team.